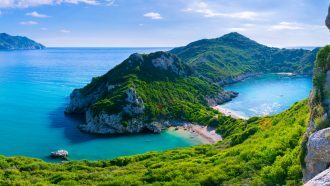 On this ten-day easy to moderate walking holiday in Corfu you will discover both the wild and gorgeous north-west coast of Corfu island as well as the north-east coast with its secluded bays and hidden coves, so beautifully described by Gerald Durrell in My Family and Other Animals. 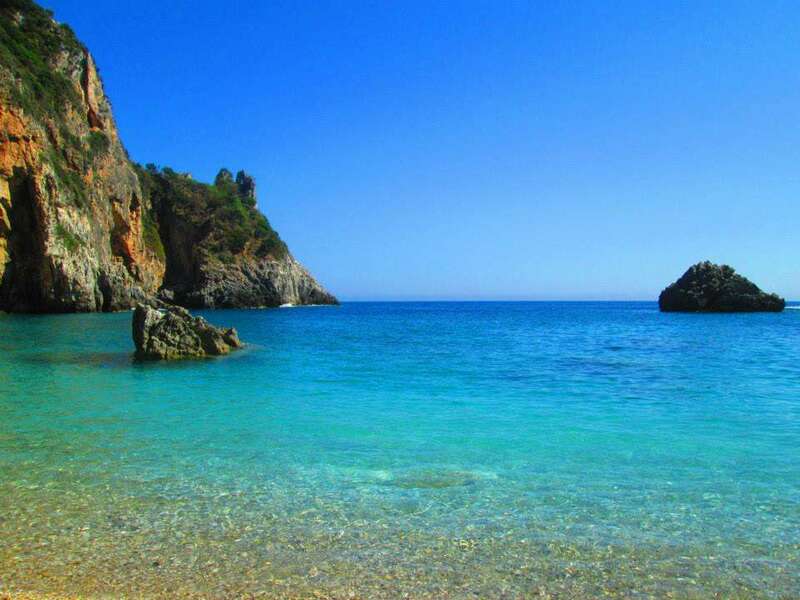 You will spend the first three nights in Liapades, an old village with impressive mansions close to a small beach and the famous resort of Paleokastritsa with its rock-top monastery and azure blue bays. From Liapades, an old path leads up to the ancient village of Lakones and offers impressive sea views. Reach the beach at Agios Georgios, where you will spend the following three nights. Walk to the picturesque hilltop village of Afionas with its narrow alleys and the double bay of Porto Timoni. You will spend the last three days in Kalami, known for the White House, the residence of the famous British writer and brother of Gerald Durrell, Lawrence Durrell. Daily walking varies between 7 and 16 km, and you may choose to extend some of the walks to your liking. On most trails, it is strongly advised to bring a bathing suit! Arrive at Corfu Airport and enjoy our complimentary transfer to your hotel at Liapades (22 km / 30 minutes). Meet our representative who will brief you on the walks and give you the maps and the documentation needed for your trip. From Liapades villages old paths will take you into the centuries-old olive groves around the towns of Kanakades and Liapades. In the town of Kanakades have a look at the beautifully frescoed church and if you’re lucky it might be open for a visit. From Kanakades you continue along the Olive Way. Reaching the surroundings of Liapades, you have the choice to go back to the village or have a swim at the secluded beach of Iliodorou, only accessible on foot or by boat. This will make the walk about 4 km longer. 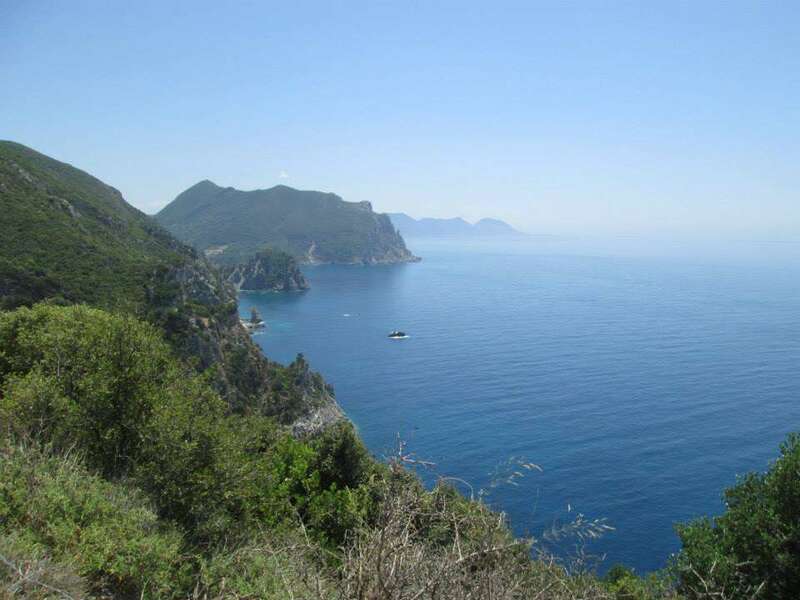 Today’s walk to Paleokastritsa offers beautiful views of the bays and rocky coast in the surroundings. The total mileage and ascent are based on the same way forth and back. 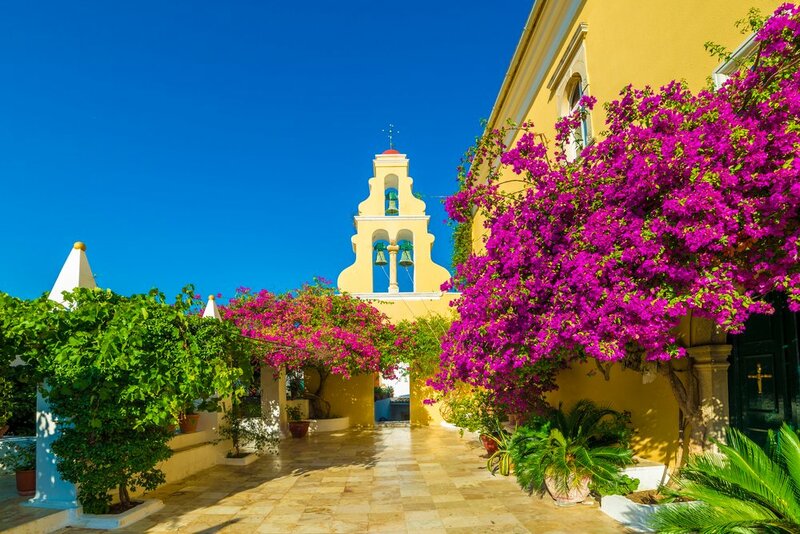 However, it is also recommended to come back to Liapades by a taxi boat/ boat tour, leaving from the small port at the bottom of the Monastery hill. This way you will have the possibility to appreciate the rocky coastline with many caves from the sea as well as from the land. 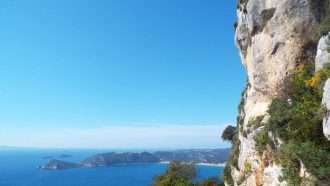 The terrain is mostly paved, apart from the first stretch leaving Liapades beach where you climb up on a steep footpath through the forest. The Monastery of Virgin Mary is located on a hill at the end of Paleokastritsa. Originally built in Byzantine times in 1225, the present buildings date from the 19th century. Monks still inhabit the Monastery. You start the day with a steep climb up to the village of Lakones, situated on the hills above Paleokastritsa. The location of this village was chosen this way so pirates could not see it from the sea. Enjoying views over Paleokastritsa’s bays, you enter the olive groves before the village of Krini. If you do not mind the extra 1.5 km and steep climb up, it is worth to visit the Byzantine castle of Angelokastro, perched on a hilltop overlooking the sea and the island towards Corfu Town. 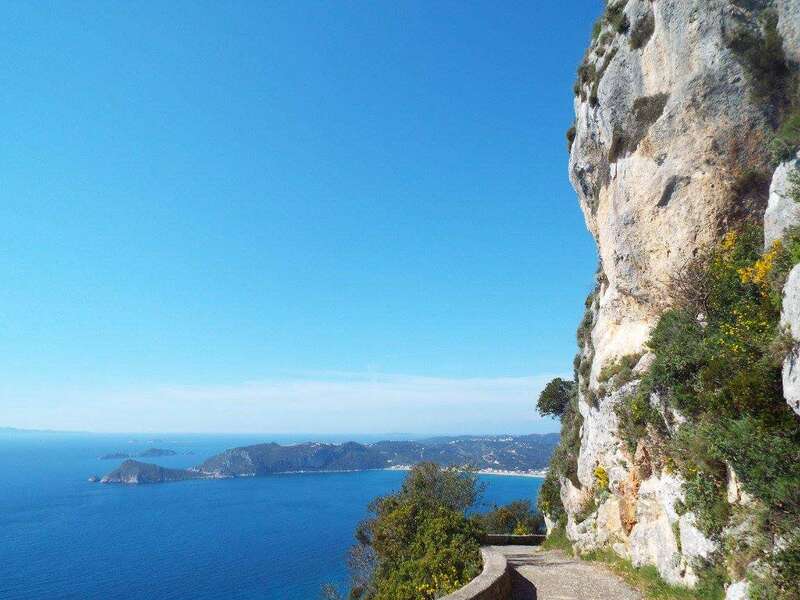 Shortly after Krini, you will be surprised with views of the northern parts of Corfu, as an ancient cobbled footpath, also called the Roman way, leads down to the west coast and the resort of Agios Georgios. From Agios Georgios, it’s a steep climb up to the beautiful village of Afionas, with its olive oil shops, narrow alleys and wonderful views. 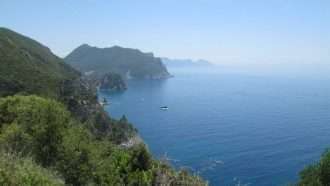 On a footpath, you descend steeply towards the sea below, where the peninsula is so thin that you can choose on which side to swim! The path continues a bit further up the peninsula to the chapel-like cave of Agios Stylianos. 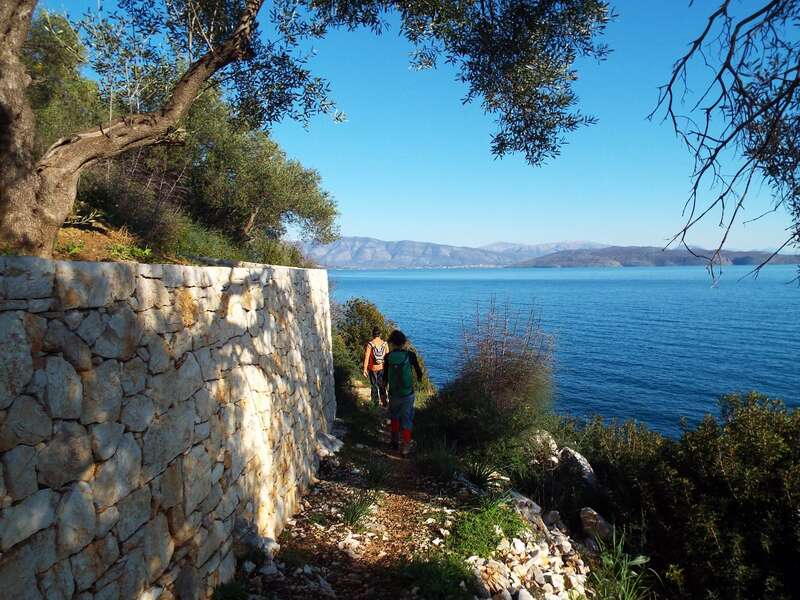 From Agios Georgios, you will follow a stretch of the main Corfu Trail up to the villages of Prinilas & Paghi. Descending a fertile valley, the walk continues towards the road in Aspiotades. From here the route turns back to the coast at Agios Georgios. Morning transfer to Kalami (40 km, 1 hour). Breakfast at Thomas’ Place. From Kalami starts a splendid walk passing by the White House (Lawrence Durrell’s residence) along the East Coast. The route will take you south through some secluded coves to Kaminaki. Another option is to walk the Mountain Flanks, going up from Agni to the flanks of Pantokrator Mountain and the ancient village of Mengoulas. Going down you will return to Kalami on the coastal path from Kaminaki. Breakfast at Thomas’ Place.Walk around Kalami, take a boat tour, or relax on the beach. 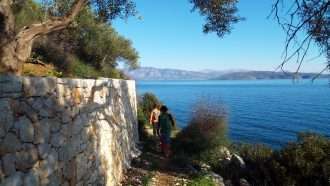 Walk the Eremitis Peninsula to Kassiopi. A beautiful coastal walk follows with a visit to the village of Kassiopi where you can also go to the Byzantine castle above the town. From the village of Kassiopi take a bus back to the main road above Kalami. Bus to Kalami not included, about GBP 2.50 pp. Accommodation is in hand-picked studio apartments or small family-operated hotels. This holiday is mostly centre based, you spend 3 nights in each of the three hotels. Some places are quite simple, but clean and all have private en-suite rooms. *Hotels are subject to availability. In case a particular hotel is fully booked for your desired dates we will replace it with a hotel of equal value and quality level. We will give to you exact accommodation details upon booking confirmation. Breakfast is always included. Half board option is possible to order. In towns there are multiple restaurants and taverns where you can sample the incredible local cuisine. Recommended arrival and departure airport: Corfu. Flight information can change rapidly and not all flights run daily. Please do check directly with the airlines’ websites or Skyscanner before finalising any booking with us. Please do not book your flights before we have confirmed your booking. Complimentary airport transfers from/to Corfu airport are included. You have all private transfers arranged for you according to itinerary, apart from the bus transfer on Day 9 and optional return by boat on Day 3. Luggage transfer is included as per itinerary and we will arange it from your current hotel to your next hotel. After check out, you will leave baggage at the hotel reception and you can start hiking. When you arrive at your next hotel, your baggage will be at the hotel reception. Language: Greek. In big cities many people speak English, but in remote areas this might not be the case. However most of the hotel staff where we stay speak English and are ready to help you. Road signs/markers are normally in both Greek and Latin alphabet – and you can always call our 24/7 help line if there are any problems. Electric supply and plugs: 220V, 50Hz, two pin round plugs. Currency: Euro (€). We strongly recommend taking adequate cash for your daily requirements. Banks and ATMs are not available outside of cities but credit/debit card payments are accepted in most places. This holiday is suitable for walkers of average fitness. Some days include optional longer walks of a moderate grade. Total walking distance is 64 km (83 km including optional walks) and average daily walking distance is 9 km per day (12 km including optional hikes), while total elevation gain is up to 2,500 m (optional: up to 3,250 m) (read more about difficulty grades). Terrain is varying from steep rocky footpaths to cobbled paths and asphalted roads. Routes are well signposted. 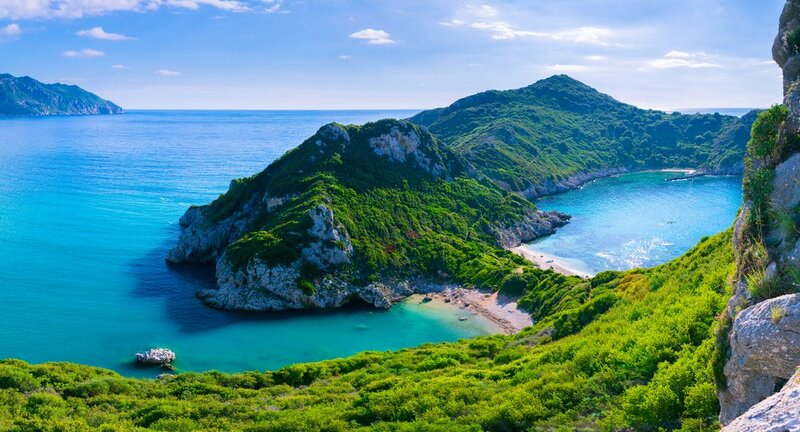 Corfu has a hot-summer Mediterranean climate. For more details, visit https://www.climatestotravel.com/climate/greece/corfu. Main luggage is limited to 25 kg. On walking days your main luggage is transported to the next accommodation. For your daily essentials, you should bring a comfortable rucksack. It is essential to bring good hiking shoes and waterproof jacket. Below is a non-exclusive list of what you should bring to this trip. We will include more detailed info in your holiday information pack. If you need further advice, please contact us or a reputable outdoor retailer. All private transfers according to itinerary, apart from the bus transfer on Day 9 and optional return by boat on Day 3. *To calculate the price of the tour for a specific date, including the cost of different options and supplements, please click the CHECK AVAILABILITY button above, pick your date and number of people. On the next screen you can choose desired options and extras and see the total price of your holiday before you decide whether to submit a booking enquiry. We really enjoyed our holiday in Corfu. I enjoyed most of the walks, I really enjoyed the walk from Liapades to Agios Georgios. Bring plenty of water on the walks as sometimes there are no cafes or restaurants found on the way! [...] The accommodation was all fine, [...] transfers were all good and local representative was good. Overall we enjoyed the holiday and would book again with the Natural Adventure Company. Overall we quite enjoyed the holiday, the weather was almost cloudless skies and 26 degrees. Some of the accommodations were rather basic - more like serviced apartments rather than proper hotels, but all nights were in en suite private rooms, very clean. Local rep was fantastic and transfers were very punctual. The trip was exceptional. Particularly enjoyed the walks and how well organized they were. The GPS tracks were a huge help, I was so glad to have them. [...] High points would have to be the walk to Agios Georgious on the change day, the walk entitled "The Roman Way", and the walk above Agious Georgious in the old hill towns above the bay, and the valley above. Anna and Marcella were exceptionally nice and helpful, when we had questions. Also the taxi driver was exceptionally nice. The walk for Stage 3 to Agios Georgios via the excellent Sunset tavern was the most enjoyable walk for us. We came across the crew filming a scene for the next series of the Durrells on a remote beach - both appropriate and memorable. I found the navigation app very useful for checking when a turning was coming along as sometimes it was easy to miss the landmarks. The trails overall were good. 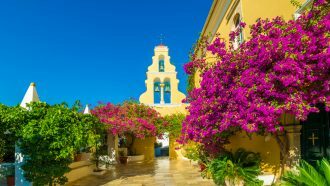 [...] I did not do the full Pantokrator walk instead opting to do the shorter walk for stage 6 along the beaches which was actually very worthwhile and Nikolas Taverna on Agni beach warrants a visit. Accommodation was fine all were clean and had plenty of room. The accommodation at Liapades (Cricketers) was a bit tired but the other 2 were good. All 3 accommodations were close to shops, supermarkets and restaurants which was good. Transfers went very smoothly. Your representative was friendly and helpful.